The cryptocurrency bear market we have experienced for over a year now is showing no signs of a reversal. Cryptocurrencis across the board, including Bitcoin (BTC), continue to hover around their lowest levels in months while some are even finding new lows. Not only are the prices drastically low, but the overall market volatility is at a standstill. 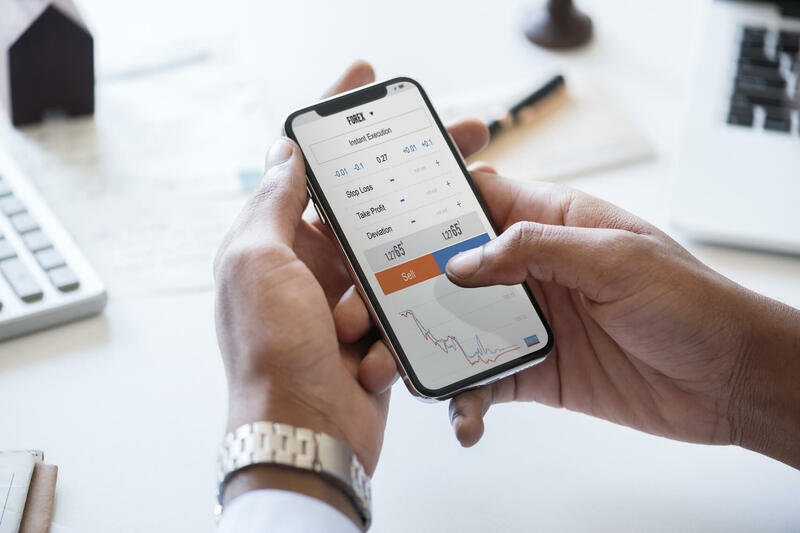 A report published by Diar, a crypto and blockchain research firm reveals there is very little interest in crypto right now as crypto exchange trade volume is experiencing new lows that have not been recorded since 2017. 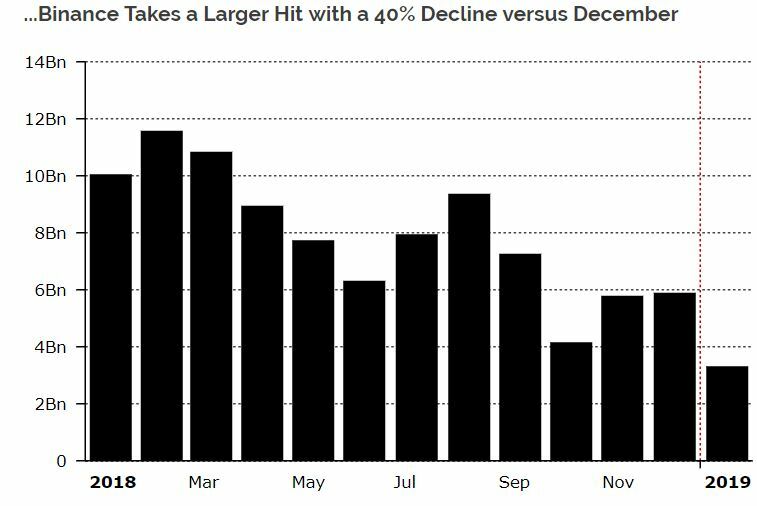 Diar notes that not only are the smallest crypto exchanges suffering from devastatingly low trading volume but even the world’s largest crypto exchanges are recording new lows. Binance, the world’s largest crypto exchange by daily trading volume, is currently experiencing their worst period for monthly trading volume as their BTC/USD market has experienced a reduction of more than 40% compared to December 2018. 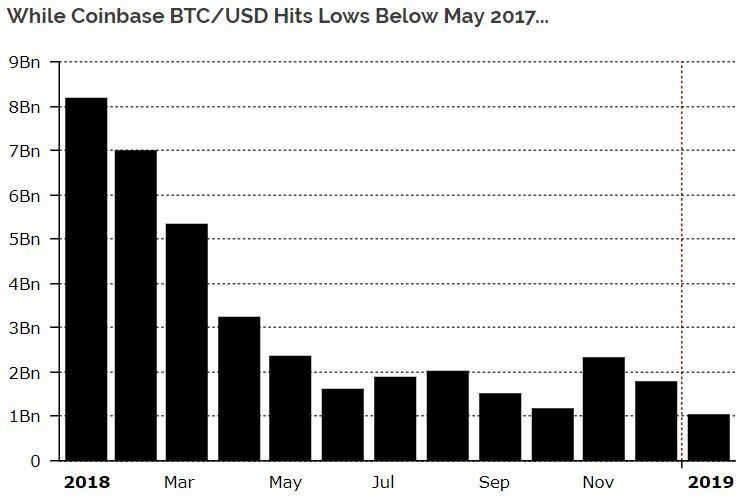 Coinbase, another prominent exchange regarded as the most popular crypto exchange in North America, is experiencing lows in their BTC/USD market (at around $1 billion) that have not been seen since May 2017. 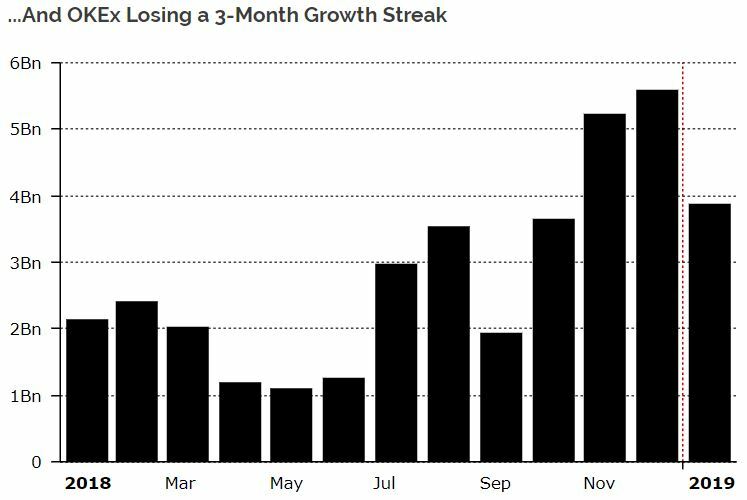 Even the prominent Chinese crypto exchange, OKEx, which has experienced an overall increase in trading volume since 2018, just recently broke a 3-month growth trend in terms of monthly trading volume. The exchange reached an all-time high in December 2018 with a monthly trade volume of $5.5 billion, and has since reported trade volume under $4 billion. As previously reported by IIB, Binance’s CEO, Changpeng “CZ” Zhao claimed the company is not worried about low trading volume as it still far above what it was 2 or 3 years ago. Zhao further stated that 2018 was a year of building and preparing for what’s to come. Since he made these comments back in November 2018, the prominent crypto exchange has launched a series of new products and made continuous developments. The most recent development is their partnership with Simplex to enable customers to purchase various cryptos with debit and credit cards. Though the crypto market is in a giant slump and have shown few signs of a recovery anytime soon, the industry as a whole continues to build and improve. The fact that crypto exchanges are clocking very low trading volumes and interest from users may signal that we are soon reaching a market bottom. Do you think we are close to a market bottom? Will crypto exchanges see a substantial spike in volume soon? Let us know what you think in the comment section below.